Last Friday’s heavy snow still leaves some part of Japan in disasters. Some towns and villages still remain isolated with disruptions of road transport by heavy snow which needs to be removed. Some even froze to death walking back on foot home from their road-blocked car. Even in Tokyo, we feel the influence of heavy snow by fresh crops and dairy products’ amount being less in supermarkets. To those who live in a snowed and cold district may find the disaster that we are facing now near Tokyo seems strange but estimating and preparing for something that we have never experienced or what hasn’t been ‘precedent’ for many years is hard for one to do. Still, looking over at the abnormal weather around the world, we are sure it will be some sort of help to be alert to the facts not only on geography-alike areas but also to the other areas as well as considering what we could do to prevent and give help to such. Even though, time passes and we are now in the Solar term of ‘Usui’, literally meaning rain-water in Japanese. This is to express that the snow eventually turn into rain at this time of the year, telling us that the coldest time is almost over. It is the season for the farmers to get ready for their work in the fields, cultivating and preparing for sowing the seeds of the crops. It is obvious that we are blessed with warmer days as the days go by. We had couple of warm nice weather this week which made us feel a lot more going out though had to be aware of the cedar pollen and other allergen for those who suffer, putting on masks which is a little annoy. Still, the temperature of today is those of winters’, 10 degrees below from yesterday’s, expecting snow again in highlands tonight. The problem of this time of the season is when you should start your seasonal change of clothing and bedding. Regarding the abnormal weather we are facing these few years, it is hard to estimate when to start the change at exact timing but following one of the old traditions of the land is still near to precise. There is one old saying , especially in the west, as “spring won’t definitely arrive until ‘OmizutoriW’ is completed”. Shuni-eW is a Buddhist service held at this time of the year in Buddhist temples all over Japan. Among them is the most famous Shuni-e service held by Nigatsu-doW of Todai-jiW in Nara which starts from 1st March to 14th March. 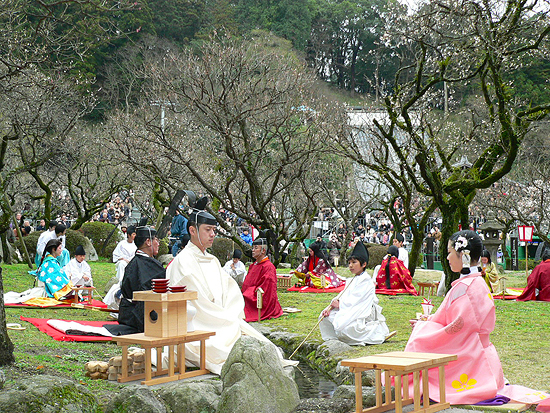 Omizutori is one of the ceremonies held at the end of Shuni-e service which is known as the Water Ceremony, cleansing sins of people as well as ushering in the spring of the new year. There is a special featured exhibition held at Nara National Museum until 16th March 2014 on Toudai-ji, Omizutori which could be interesting for those expecting to see the Fire Ceremony from today until 12th March. 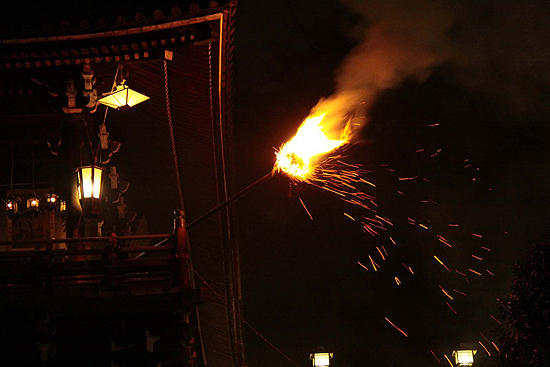 ‘Fire Ceremony’, the most famous ceremony of Shuni-e at Nigatsu-do, Toudai-ji. Today’s seasonal phrase is about ‘Soumoku’, meaning trees and plants. Even if the temperature goes back and forth, nature knows and germinates at the right timing. The phrase expresses about the movement of the trees and plants with the two verbs, ‘moe’ and ‘ ugoku’. ‘Moe’ is a Japanese verb for bursting into bud, which today, is more often heard in young generation culture, especially among Anime, Manga and Otaku subculture fans expressing their feeling of having a crush on, like ‘moe chara (moe character)’ . ‘Ugoku’ is a verb for ‘to move’, which has a same sort of meaning as ‘moe’, giving a stress on the action made by the trees and plants in the nature. Living in a weather which we are facing now surely gives us an imaginative idea of trees and plants outside waiting to grow in a great speed while sun shines between cold wintery weather left, like as if they also know that Shuni-e is been held temples all over Japan, the real arrival of spring. Girls Day or the HinamatsuriW on 3rd March is one of the five seasonal festivals of a year in ancient Japan with Shangsi FestivalW of China at its’ origin. The day was thought to be the best day to invoke the cleansing rituals to prevent disease and get rid of bad luck by visiting rivers, lakes and sea. This old custom changed its form into several forms as going out on picnic on the very day or holding a poetry gathering party called ‘Kyokusui-no-en’. ‘Kyokusui-no-en’ at Dazaifu Tenmangu, Fukuoka held on 2nd March. Photo from ‘Fukuoka Now‘. 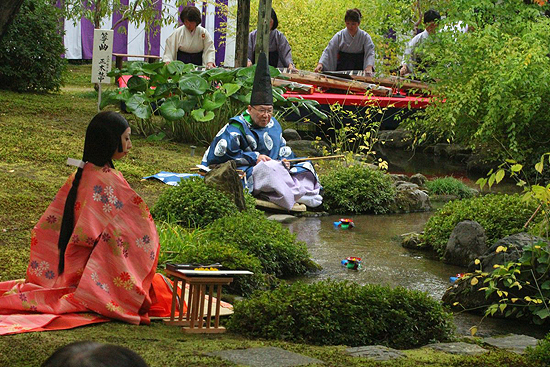 Kyokusui-no-en is held in a garden with a running stream which is used to float sakeW cup on. Invited guests who should have talents in making poetry would be sitting by the stream, thinking about the verses of the poem read according to the given theme until the floating sake cup runs in front of the poet. Kyokusui-no-en were held on the day of Shangsi Festival around 3rd March in Lunisolar calendarW which in our calendar today should be about a month later. You can still see this beautiful festival taking place in some parts of Japan today like Dazaifu Tenmangu in Fukuoka prefectureW (taking place on 2nd March in 2014) and Jonangu in Kyoto (taking place on 29th April in 2014). ‘Kyokusui-no-en’ of Jonangu, Kyoto which takes place late April. Photo from ‘Haisha no tsudedure blog‘. It is not certain that it is because Shangsi Festival was related to ‘water’ that the very day of the festival was set on the early day of ‘Mi’ or ‘Shi’, the Snake(zodiac)W which is thought to be a familiar of BenzaitenW, or the other way round. Benzaiten is a goddess who came into Japan from India through China, a changed form of Hindu goddess, SaraswatiW. Like Saraswati, Benzaiten was a goddess of water and agriculture in the beginning, gradually brought into one of the goddess of nation protection as well as music, arts, education and wealth. It is interesting to know that Benzaiten at her original form, Saraswati, does not have snakes or dragons as her familiar which are thought to be divine beasts strongly related to water. The day of ‘Mi’ or ‘Shi’ is thought to be a day to have special relation with Benzaiten. 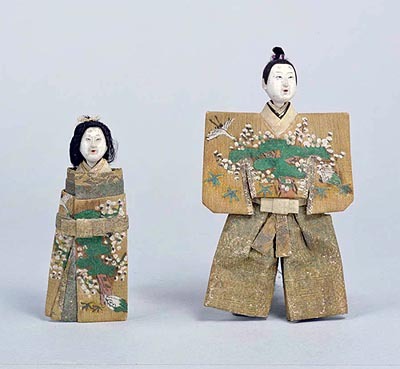 Oldest style hina dolls, ‘tachi-bina’ from early Edo period. Photo from ‘Tokyo National Museum Image Search‘. Regarding such tradition and beliefs, the day of Shangsi Festival rooted in Japan as ‘Joshi-no-sekku’ or ‘Joshi’ which combined with the custom of nobles’ children playing with and decorating well-dressed dolls and doll houses or belief of transferring miasmas onto paper, cut or made into doll shape and let it wash away in the river streams in Heian periodW. ‘Kanei-bina’, the next old style hina dolls in more detailed kimonos than earlier hina dolls. Photo from ‘The Tokugawa Art Museum‘. 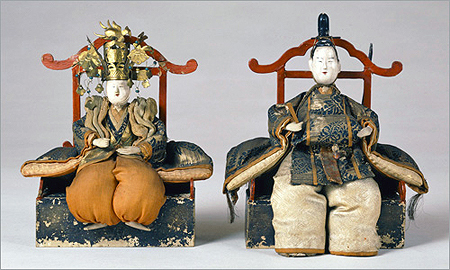 It was thought to be these two custom and tradition that became the origin of Hinamatsuri today which came into shape of decorating a pair of female and male dolls in Edo periodW. Still, the meaning of transferring miasmas was strong in early years which gradually became into deluxe shape as a substitute of the daughters’ entire lucky lives. 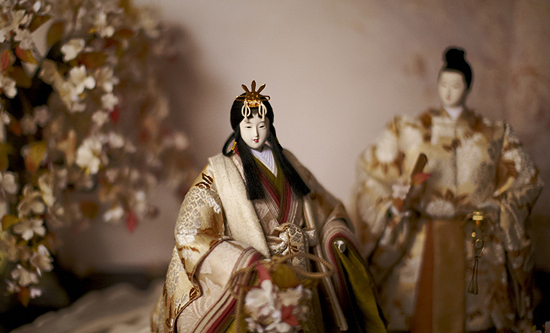 The ‘Hina’ dolls became one of the girls’ trousseau for those of the nobles and wealthy by the closing of the Tokugawa shogunateW, which after the World War II became reachable among all. 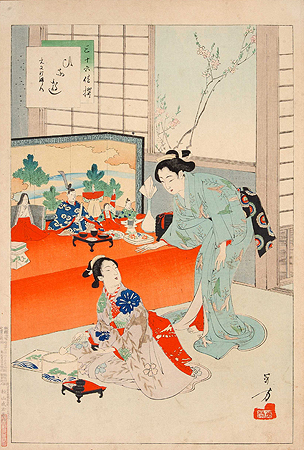 A scene of Hinamatsuri of a wealthy family of early Meiji periodW. You can see that the hina dolls are more llike the style you see today. Painted by Toshikata Mizuno. Today, Hinamatsuri is celebrated in houses with young daughters. Hina dolls are decorated about a month before to cerebrate the day, eating SushiW, ‘Hina-arare (sweet rice crackers for Girls Day)’ and drinking ‘Shirozake (sweet white sake)’. Peach blossom branches are decorated as a charm against evil spirits as well as giving sweet and pretty image to the whole decoration of the day. Parties could be held with friends after school (if it is on weekday as the day is not a national holiday) which is one of the memories every Japanese women should have. Classical but modern, beautiful original new type hina dolls. These gorgeous dolls would definately fit into western style houses too! Photo from Goto Dolls Official Site.